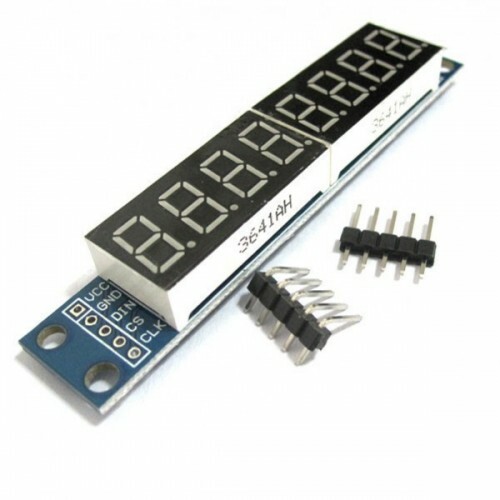 This 8 digit seven segment display module is based upon the Maxim MAX7219 LED display driver. 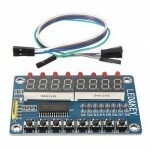 The module uses two standard 4 digit seven segment displays to display a total of 8 digits in RED with decimal point. A convenient input and output header allows additional modules to be daisy-chained and controlled with just just 3 digital IO pins. The Maxim MAX7219 driver allows for each segment of up to 8 digits (with decimal point) to be controlled individually from a serial interface. 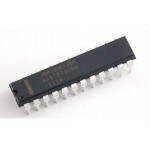 An 8x8 static ram area stores each digit and multiplexing the display is handled automatically. 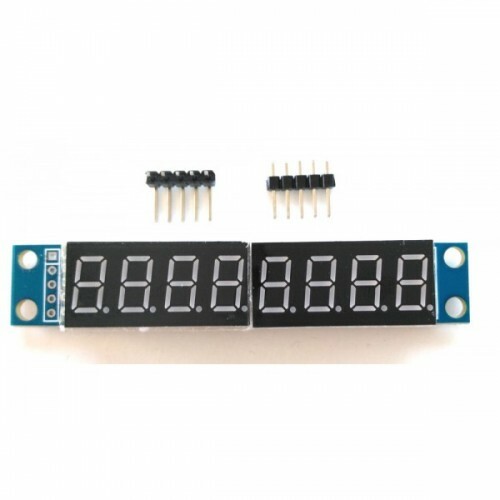 16X16 LED Matrix Display ModuleThis 16×16 Display module uses the 74HC138 and 74HC595 to decode and ..
MAX7219 8-Digit LED Display DriversThe MAX7219 is a compact, serial input/output common-cathode disp..